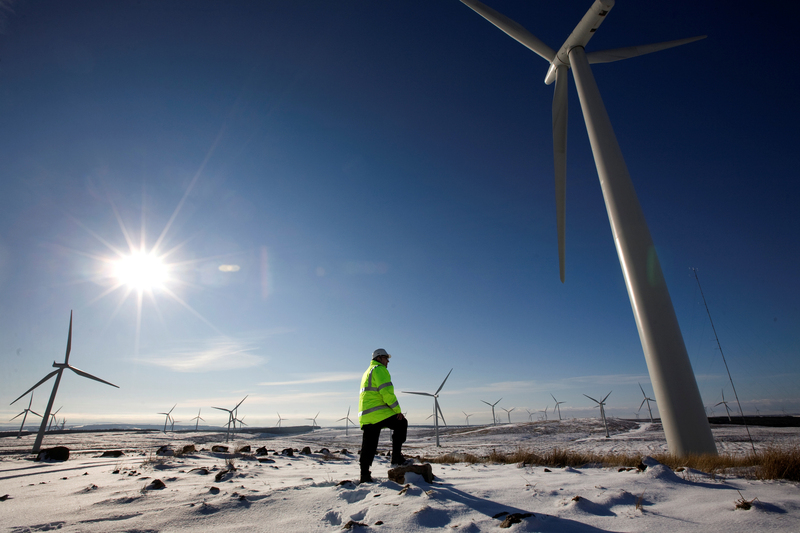 Output from Scotland’s major wind farms fell to as low as 2.5 per cent of their potential generation capacity during the record cold snap. Scotland’s wind farms froze up in the record freeze this month forcing the government to rely on power from French nuclear plants. SCOTLAND’S wind farms are unable to cope with the freezing weather conditions – grinding to a halt at a time when electricity demand is at a peak, forcing the country to rely on power generated by French nuclear plants. Output from major wind farms fell to as low as 2.5 per cent of their potential generation capacity during the cold snap as power demand rose to close to the highest level yet recorded, new figures have revealed. Meteorologists say extremely cold temperatures can occur only when there is little or no wind and icy pockets of air are trapped close to the ground, prompting accusations from anti- wind-farm campaigners that wind power cannot be relied on to meet Scotland’s electricity needs in the depths of winter. The data, charted on the Balancing Mechanism Reporting System website, which the National Grid uses to monitor UK power generation, also revealed that at times when wind energy was at its lowest, back-up power had to be piped in from France, where the majority of electricity is nuclear-generated. The Scottish Government is opposed to nuclear power, insisting no nuclear plants will be built in Scotland once Hunterston B in Ayrshire and Torness in East Lothian are decommissioned, in 2016 and 2023 respectively. Over the past ten days, when temperatures have plunged across Scotland, the average power generation from Britain’s wind developments – the majority of which are in Scotland – was 261 megawatts (MW), just 10.75 per cent of the total possible of 2,430MW. Last Monday and Tuesday afternoon wind production fell to a major low while electricity usage peaked close to its highest level. The Scottish Government said there was no need to import electricity during the worst of the cold snap even though wind energy plummeted to almost nothing.